For the accelerated patent examination program also known as PPH 2.0, see Patent Prosecution Highway. 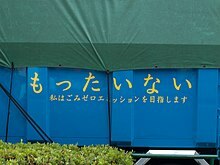 Mottainai written on a truck, followed by the sentence "I strive towards zero emission"
Mottainai (もったいない or 勿体無い) is a term of Japanese origin that has been used by environmentalists. The term in Japanese conveys a sense of regret over waste; the exclamation "Mottainai!" can translate as "What a waste!" Japanese environmentalists have used the term to encourage people to "reduce, reuse and recycle", and Kenyan environmentalist Wangari Maathai used the term at the United Nations as a slogan to promote environmental protection. Mottainai is a Japanese term conveying a sense of regret concerning waste. The expression "Mottainai!" can be uttered alone as an exclamation when something useful, such as food or time, is wasted, meaning roughly "what a waste!" In addition to its primary sense of "wastefulness", the word is also used to mean "impious; irreverent" or "more than one deserves". Mottainai in Japanese refers both to physical waste and to wasteful action. MacQuillan and Preston propose a more elaborate translation that conveys a sense of value and worthiness as "do not destroy (or lay waste to) that which is worthy". A modern observance that practices mottainai[clarification needed] is the yearly festival of Hari-Kuyō, or the Festival of Broken Needles. At the Opening Ceremony of the Science and Technology in Society Forum in 2005, Japanese Prime Minister Junichiro Koizumi stated: "In Japan, there has long been a spirit characterized by the word mottainai, which could be translated as 'don't waste what is valuable'." Dr. Maathai, brandishing a t-shirt emblazoned with the word MOTTAINAI, explained that the meaning of the term mottainai encompasses the four Rs of reduce, reuse, recycle and repair ... [and] made the case that we should all use limited resources effectively and share them fairly if we are to avert wars arising from disputes over natural resources. Maathai has worked to popularize the word mottainai in places outside Japan. At the 2009 United Nations Summit on Climate Change, she said, "Even at personal level, we can all reduce, re-use and recycle, what is embraced as Mottainai in Japan, a concept that also calls us to express gratitude, to respect and to avoid wastage." ^ Alan G. MacQuillan; Ashley L. Preston (1998). Globally and Locally: Seeking a Middle Path to Sustainable Development. University Press of America. p. 157. ISBN 978-0761811268. ^ a b Chiba, Hitoshi (November 2002). "Restyling Japan: Revival of the "Mottainai" Spirit". Look Japan. Archived from the original on April 5, 2004. Retrieved July 22, 2013. ^ "Speeches and Statements by Prime Minister Junichiro Koizumi". japan.kantei.go.jp. ^ Murko Siniawer, Eiko (2014). "'Affluence of the Heart': Wastefulness and the Search for Meaning in Millennial Japan". The Journal of Asian Studies. Cambridge University Press, Association for Asian Studies. 73 (1): 165–186. doi:10.1017/S0021911813001745. JSTOR 43553399. ^ Sasaki, Mizue (7–9 November 2005). Perspectives of language: cultural differences and universality in Japanese (PDF). Paris: UNESCO. pp. 124–125. ^ Iwatsuki, Kunio (2008). Sustainable Use of Biodiversity, with Reference to the Japanese Spirit of Worshipping Nature (in "Conserving Nature, A Japanese Perspective") (PDF). Biodiversity Network Japan. pp. 4–11. ISBN 978-4-9901743-1-6. Archived from the original (PDF) on January 9, 2015. Retrieved July 25, 2013. ^ "Statement by Prof. W. Maathai, Nobel Peace Laureate, on behalf of Civil Society" (PDF). United Nations. Archived from the original (PDF) on 2011-06-01. Retrieved 24 February 2018. Cited in Maruko Siniawer, 2014, p. 177. Shuto, Toshimoto; Eriguna (2013). "Kindergarten Children's and Teachers' Cognitions of 'Mottainai' and Their Socio-Moral Judgments about Environmental Deviancy". Journal of Saitama University. Faculty of Education. 62 (1): 25–36. Retrieved 24 July 2013.